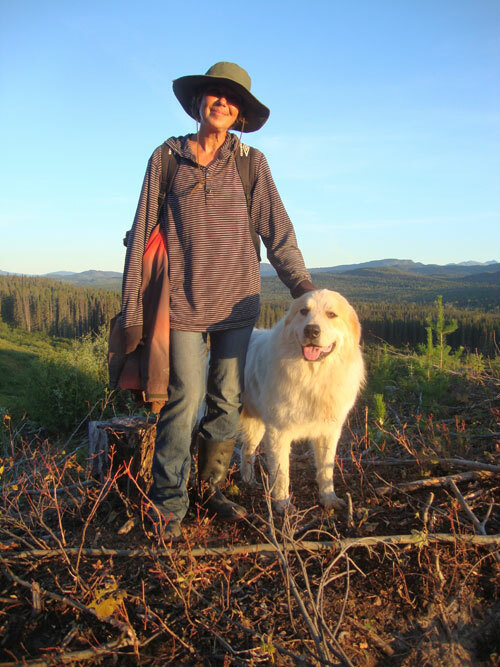 We never tire of hearing about livestock guardian dogs at work. Most often these dogs are working on farms or ranches. But what about the BC Interior... deep inside Grizzly country? 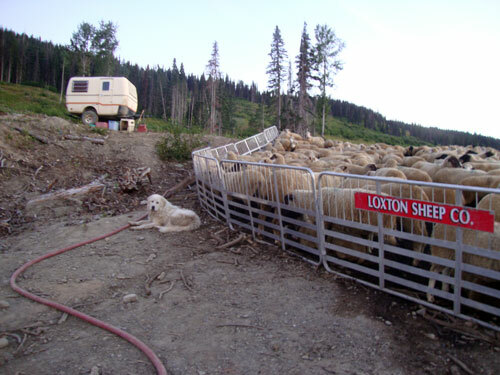 That's where Dennis Loxton takes his sheep and has gained as much experience with working livestock guardian dogs as anyone. Here's his latest account of the 2013 season in the forests of BC. My family and I have been BC silvicultural contractors for about 40 years. 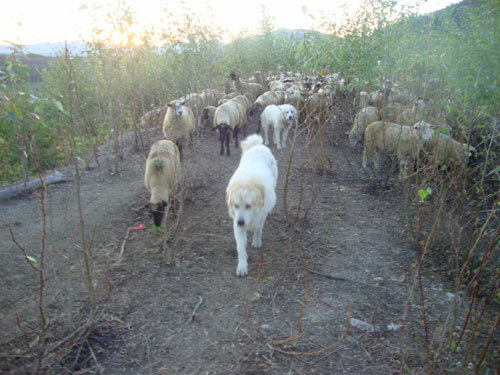 Our specialty for the past 18 years is called “Sheep Vegetation Management”. That means that my three sons and I are shepherds. For most of the eighteen years we had 6,000 sheep to take care of, which we divided into four flocks of 1,500 sheep per flock. 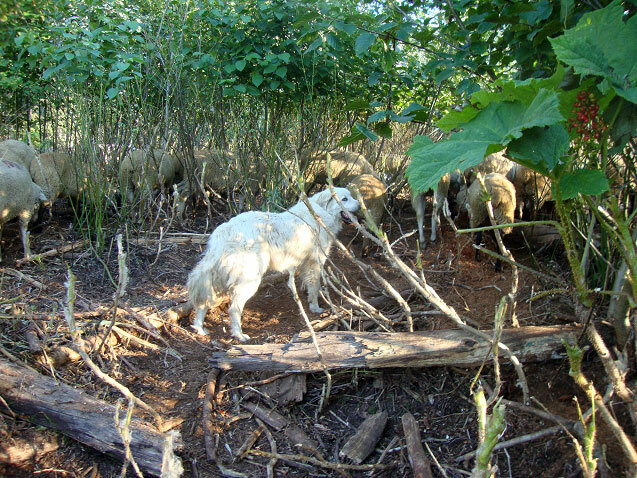 Each flock had four to eight livestock guardian dogs, dependent on the local predator type and populations. 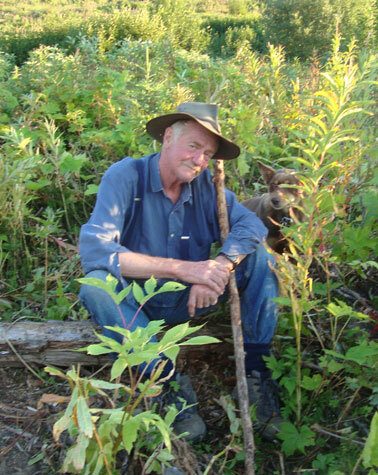 We always worked way out in the forests, and often about a hundred kms or more from any town, so of course, no matter where we went, we were always in the back yard of some predator or other. 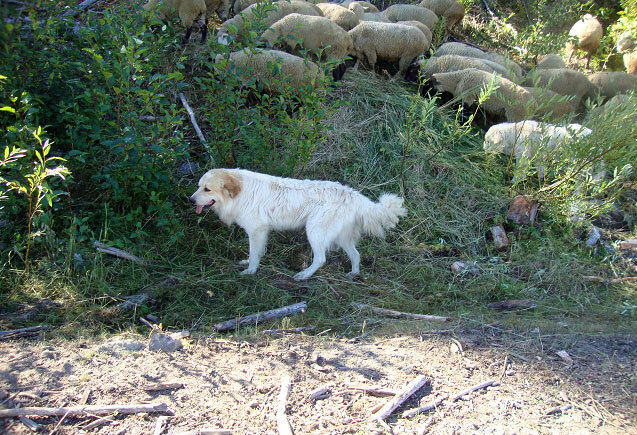 Obviously it was important for us to have plenty of livestock guardian dogs to guard the flocks and us. 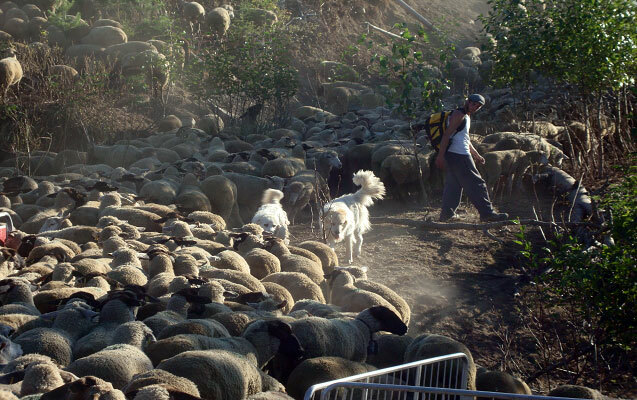 Obviously it was important for us to have plenty of livestock guardian dogs to guard the flocks and us. 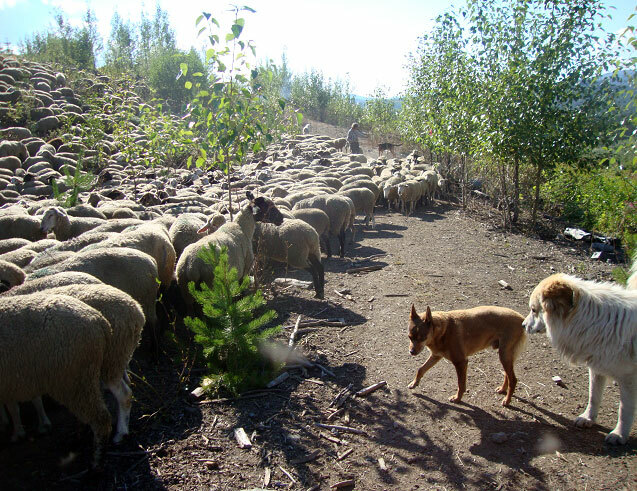 We also had about four sheep herding dogs per flock, so in total we usually had about 50 dogs working with us per season, and I believe that they were all very simply amazing. It's very hard to grasp just how good livestock guardian dogs actually are. Just when you think that you know what they are capable of, they will do something even more amazing and surprise you all over again. My sons have all been herding sheep out bush for at least fifteen summers, and yet even after that much time watching sheep and the guardian dogs at work, they would still phone me and say “Dad you wouldn't believe what the guard dogs did today,” and then they'd launch into some tale of dogs and bears or wolves that would still shock us, even after all of those years of being amazed. It's very hard to grasp just how good livestock guardian dogs actually are. 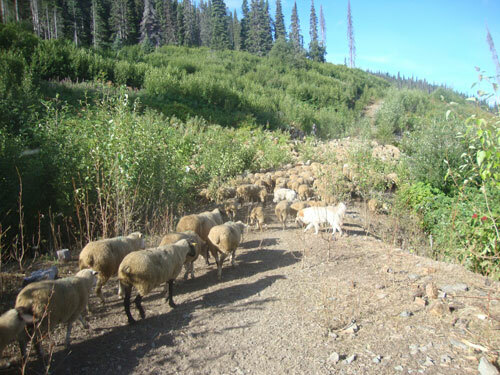 In the summer of 2013, we had a contract to graze one flock of 1,500 sheep on a plantation way out in the forest North West of Ft St James, British Columbia. There were three of us shepherds, three sheep herding dogs (2 Australian Kelpies and a New Zealand Huntaway) and four livestock guardian dogs. 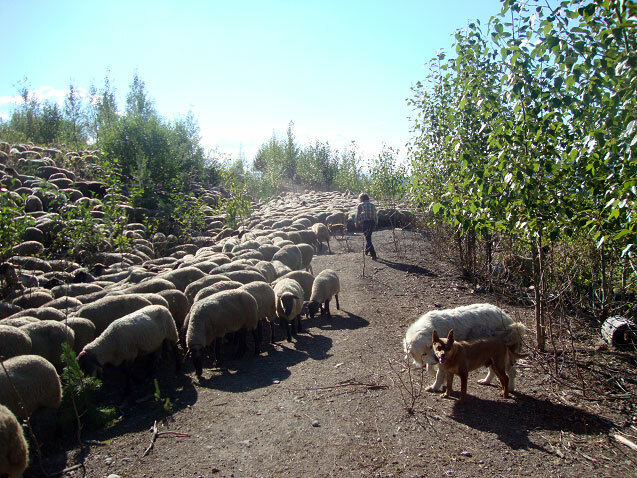 We rented the sheep and guardian dogs from our Hutterite farmer friends who lived in Alberta. The guardian dogs arrived with the sheep on the trucks, and we were very happy to see that our friends had sent us four mature, very serious looking dogs. There were plenty of predators in the area, including Grizzly bears, Black bears, and huge timber wolves, but we were confident that these four dogs would do a good job of guarding, so we weren't very worried about predation. The farmers had forgotten to tell us the names of their guardian dogs, except for a beautiful big Great Pyrenees male, which their kids had named Marshmallow as a puppy, because they said that “he looked like a marsh-mellow when he was curled up as a new born ball of white fluff”. We were out of contact with the farmers, so we chose temporary summer names for the other three dogs ourselves. The pair of Great Pyrenees that were owned by Bill and his wonderful wife Dora, responded to the names “Bill and Dora”, which became their new names for the season. 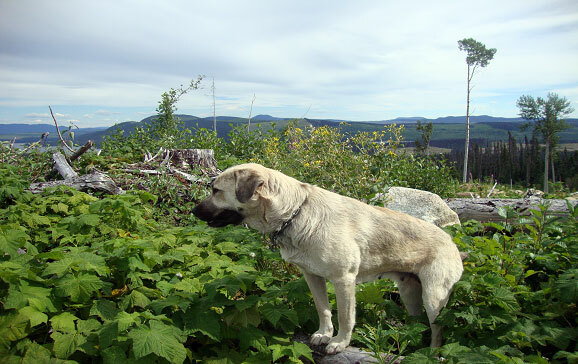 The fourth dog was a very serious, big female Anatolian Shepherd which we named “Anna”. This didn't make any difference to her at all, because she didn't like people and so she didn't care what we did or what we called her. Anna simply guarded the sheep and she didn't ever come near us for pats or for any other reason. She would only approach her food dish after we had left it. Basically she was a big tough wild dog that lived to guard her sheep. That was just how she was and it worked, so it was OK with us. Big Bill was clearly the boss dog and he took up the boss dog position of leading the flock, while his girlfriend Dora brought up the rear. Marshmallow took his position of guarding one side of the flock and Anna took the other side. They sorted out these positions themselves, based on their dog pack pecking order, and it was perfect. This flock was very well guarded, twenty four hours per day to the point where we shepherds enjoyed seeing the occasional bear show up just for the entertainment value of it, because we felt completely confident in the abilities of our dog pack and we knew that our sheep were always safe. We enjoyed a pleasant summer. The foresters were happy with our vegetation management work, the sheep got fat and us three shepherds were all good friends, so life was good. The three Great Pyrenees were truly big, beautiful, friendly dogs which would come to us for pats and encouragement, but Anna always stayed her distance from us. She simply didn't like us or anything except her sheep, and there was nothing that we could do about it. She was a big powerful block of muscle that worked really hard at her job. Some guardian dogs are just not friendly, so we just accepted her for how she was. Anna released her grip on Marshmallow's throat and she stepped back and took a good look at me with an attitude which seemed to say “What's your problem?” and then she just walked away and back to her job. Then he went back to his side of the flock and back to work. 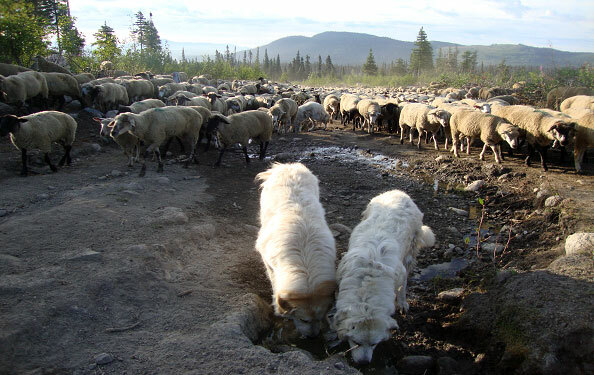 The whole thing was all quite shocking to me because even though I had seen plenty of serious dog fights in my eighteen years around sheep in the forests of BC, I had never seen such a silent, deadly attack. I didn't like Anna at all after that, which didn't really bother her at all because she simply didn't care. Well, we all just continued doing our work, everything was going well, and the dogs were all working wonderfully. Sometimes bears came to check us out but they were always chased away by the dogs, and all in all we were enjoying a pleasant summer. Our contract was divided into two separate areas that were 105 kms apart, so we knew that we would be doing a mid-season camp move, which would involve a sheep truck for two days. Usually we would load the guardian dogs onto the sheep truck along with the sheep. Sometimes they didn't want to go into the truck, but we man-handled then up the loading chute and into the truck. We'd done it for years without any problems, but we started worrying about the prospect of man-handling Anna. We'd sit around our camp fire in the evening and make our plan, which was to try to quickly load the dogs along with the sheep as usual, but we all agreed that we would not try to man-handle Anna for any reason. We felt certain that if we man-handled her and if she objected and decided to kill you, you were going to die for sure. Well, camp move day came along. The sheep and dogs were in the pens ready for loading, the trucker was professional and efficient and it was all going very well. 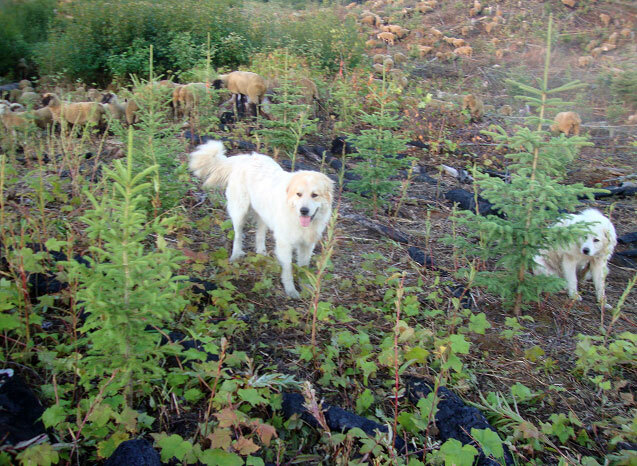 First we loaded up about 200 sheep and then grabbed Marshmallow and forced him up the loading chute and into the truck, but seeing that, the other three guardian dogs immediately jumped over the fence and ran away into the forest. It all happened so quickly that there was nothing that we could do about it. A shepherd ran after them, but that was pointless because there is no way that you can catch three big guardian dogs in the forest if they don't want to be caught, so we just continued loading sheep and moving our camp to the new location 105 km away. Sheep truck rental is expensive and the meter was running, so we quickly moved all of the sheep and equipment and decided that we would come back later and get the three dogs. Then we put out a lot of dog food at the old camp site for them so that hopefully they would stay around there. The next day a shepherd went back there to catch them but they were not there, and so we were very worried about them. Firstly, we needed then to help Marshmallow to guard our flock for the rest of the season, and secondly, if we lost them we would have to pay for them. Two days after the camp move Bill and Dora came trotting into our new camp, smiling with big tails wagging, and clearly just as happy as can be. They were obviously extremely happy to see their sheep and us, and we were amazed at the fact that they had found our new camp. Not only was it 105 kms from the old camp, but the logging road was complicated with many turns and intersections, plus lots of logging traffic. A shortcut was not possible because of a serious river. They must have followed the scent of their sheep friends and the truck. We were so impressed and happy with Bill and Dora, but disappointed that Anna had not came along with them too. 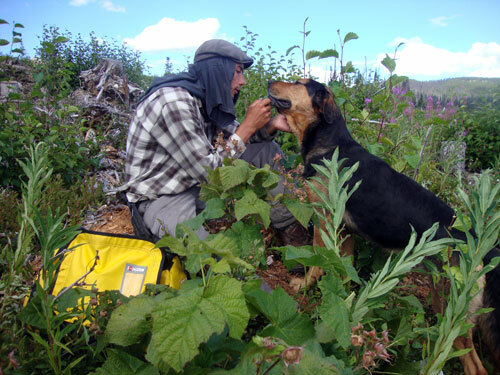 Whenever we could spare a shepherd to do the 210 km round trip to look for her we did, but we were very busy and the logging road was rough and slow, so we could not go often. There was a logging camp about 30km from our old camp site and we thought that she may show up there looking for us, so we made arrangement with the camp cook to put out camp food scraps for her to eat. Loggers reported to us that they had caught glimpses of her coming in for food, but that she was very shy and impossible to approach. We found the news encouraging as we now knew where she was and felt confident that she would stay there and that we could catch her there later. Well the season ended and we sent all of the sheep and dogs back to Alberta. Then we broke the bad news to the owner of Anna of why she wasn't on the truck with his sheep, and did our best to reassure him that we would find and deliver her to him soon. 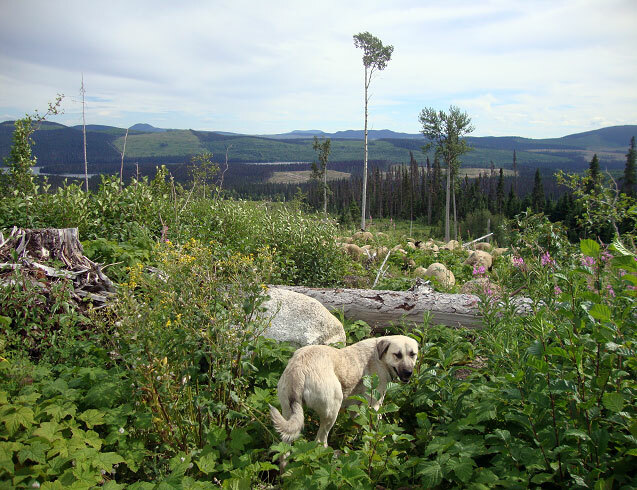 Then the forester phoned us to say that some loggers had came to their office concerned for a dog and sheep that they had seen beside the logging road. What's that, dog and sheep? Then it all made sense to us. Obviously the three dogs had known that there was an injured sheep on the plantation near the old camp and so they had jumped out of the pens and gone back to their job of guarding their sheep. Then Bill and Dora had left Anna to guard that sheep, while they trotted the 105km to our new location to help Marshmallow guard the flock. Wow, very impressive indeed, so two of us drove back out there to catch Anna and the sheep. We stopped at the logging camp to find out where they had seen them last and the loggers were very happy to tell us that they had been giving Anna their lunch left-overs after work every day. We drove to the place where they had last seen her, and sure enough, there they both were, dog and sheep side by side, and Anna was smiling and clearly happy to see us. She came over to get some food and we were able to catch her and put her into the Jeep. Then the sheep started climbing up a steep hill and we were able to catch her by the back leg and load her too. Upon examination of the sheep, we found that she had a huge hole in her chest that you could have easily fitted your fist into, but it was completely clean because Anna had been licking the injury and taking very good care of her friend. The ewe must have impaled herself on sharp logging slash and torn her chest open. We were extremely impressed with all four of the guardian dogs, but especially with Anna. She had been taking good care of that sheep way out there in the forest all alone for about six weeks, guarding her against predators and caring for her chest injury. What an amazing dog, and I was completely ashamed of myself for having misjudged her so harshly. She stayed with that sheep at our farm for a while after that and we became friends, and she would come to me for pats in her own shy way, but always with a huge smile on her face. 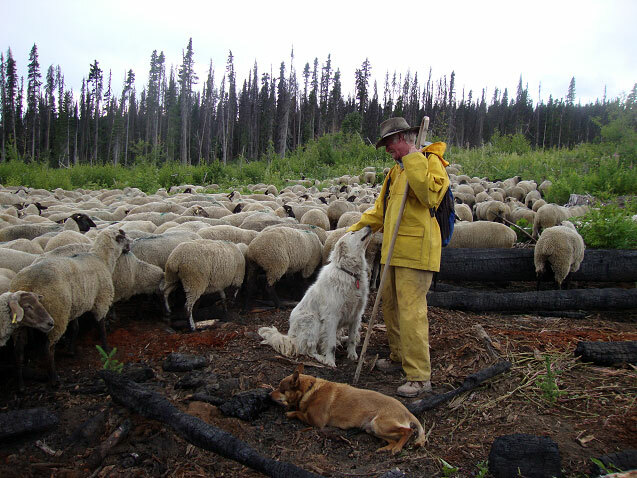 So that was our eighteenth successful grazing season with a dog pack of amazing guardian dogs, and another season of grazing sheep way out in the forests of BC with zero predation, thanks to the dogs. Our thanks to Dennis Loxton for permission to publish this article. Here are more pictures from 2013 in BC. Return from Livestock Guardian Dogs to Home.